Just a few photos from the weekend spent with friends, we did a little photoshoot wearing my new leather jacket, neon shoes and top, with that - I created a rocker glam type of look. A smokey cat eye can do the trick. The lips were kept neutral as well, I didn’t want the look to be too much. A great and popular rocker chick hairdo is shoulder length and have messed it up a bit. What do you think? This is one of my favorite styled looks of recent months. It's one of my fav looks too. 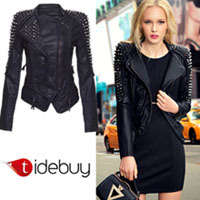 I just love the leather jacket and how you make it glam rock! Nice outfit ! I love your shoes. ALL I CAY YOU ROCK IT GIRL ! Beautiful look!! I love your shoes!! Have a good week, dear! omg im in love with your shoes<3 niice outfit! Wow, I love the neon accents! Thanks for commenting on my blog, but I don't see you in my list of followers? Let me know so I can follow back. i always love the black outfit! i love this pics my dear! Loving pants, u have great style! You look so lovely. Adore your outfit.